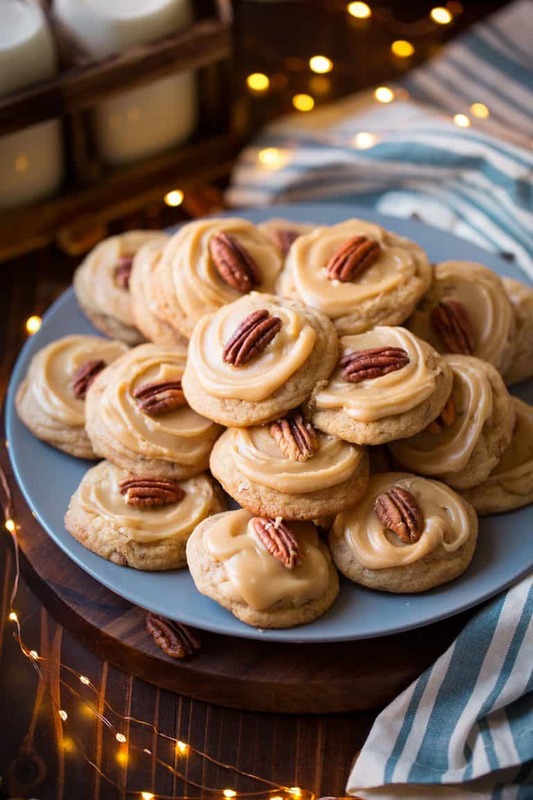 A chewy cookie brimming with toasted pecans and covered with a caramel or penuche-like frosting. Such a delicious holiday cookie! In a medium mixing bowl whisk together flour, baking soda an salt for 20 seconds, set aside. In the bowl of an electric stand mixer fitted with the paddle attachment cream together butter and brown sugar until well blended. Mix in egg and vanilla. Add in flour mixture and mix just until combined then mix in pecans. Scoop dough out and shape into balls, about 1 1/2 Tbsp each (or using a medium cookie scoop). Drop onto prepared baking sheets spacing them 2-inches apart. Bake in preheated oven until nearly set, tops should appear under-baked, about 9 minutes. Cool on pan several minutes then transfer to a wire rack to cool completely. 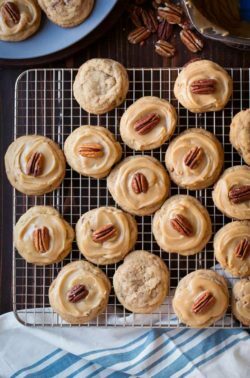 Frost with brown sugar icing and add a pecan to each immediately after frosting each one before the frosting starts to set. Store cookies in an airtight container at room temperature. In a small saucepan bring brown sugar, half and half and butter to a boil stirring constantly. Continue to boil, whisking constantly, 3 minutes. Remove from heat and stir in powdered sugar. Let cool several minutes until it starts to thicken, stirring occasionally. Thin with 1 tsp hot water a time as needed.